The World Space Week 2018 poster was unveiled today by World Space Week Association (WSWA). UN-declared World Space Week, October 4-10 annually, is celebrated by thousands of organizations. World Space Week 2017 had over 3,700 reported events in 80 nations according to WSWA. The 2018 poster depicts the theme “Space Unites the World.” The theme is chosen by the WSWA Board of Directors, chaired by Dr. Francisco Javier Mendieta, Director General of the Mexican Space Agency. “This year’s poster symbolizes how space brings the people of the world together,” said Dr. Mendieta. “Communication satellites keep people close by linking places far apart. Earth observing satellites help keep people safe in case of disasters. And global positioning satellites help us find our way in this vast world,” he said. This year’s theme recognizes UNISPACE + 50, a United Nations conference of world space leaders to be held next month in Vienna, according to WSWA. The UN General Assembly declared World Space Week in 1999 as an annual international celebration about space. The 2018 poster was designed by student Hannah Halcro, selected in a global poster contest by the WSWA Board, said Association President Dennis Stone. Hannah is an undergraduate aerospace engineering student at Concordia University in Montreal, Canada, and is active in the student group Space Concordia. “I first got involved with World Space Week in 2017 when students put together the first Montreal Space Symposium, a two-day public event the goal of making space accessible to everyone,” Hannah said. “I enjoy balancing the art and technical aspects of engineering, ” she said. 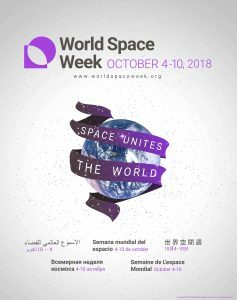 The Association will distribute the poster in print and electronically in June to World Space Week coordinators and participants in preparation for October 4-10’s global festivities. World Space Week Association is an international non-government organization and was incorporated as an IRS-approved 501 (c)(3) non-profit organization in the United States in 1982. It is led by an esteemed Board of Directors comprised of global space leaders and other dignitaries, an executive team that manages operations, and volunteers that support them. The mission of the Association is to strengthen the link between space and society through public education, participation, and dialogue on the future of space activities, using World Space Week as a focus. The Association has permanent observer status on the UN Committee on the Peaceful Uses of Outer Space and is supported by voluntary contributions of sponsors including Lockheed Martin.